The Planning Commission formed a Task Force in 2005 under the Chairmanship of Secretary, Ministry of Urban Development (MoUD) to develop a multi modal transit system for Delhi National Capital Region (NCR). This was included in the Integrated Transport Plan for NCR 2032 with special emphasis on Regional Rapid Transit System (RRTS) connecting regional centres. The Task Force identified 8 corridors and prioritised three corridors namely Delhi-Meerut, Delhi-Panipat and Delhi- Alwar for implementation. In Mar 2010, National Capital Region Planning Board(NCRPB) appointed M/s. 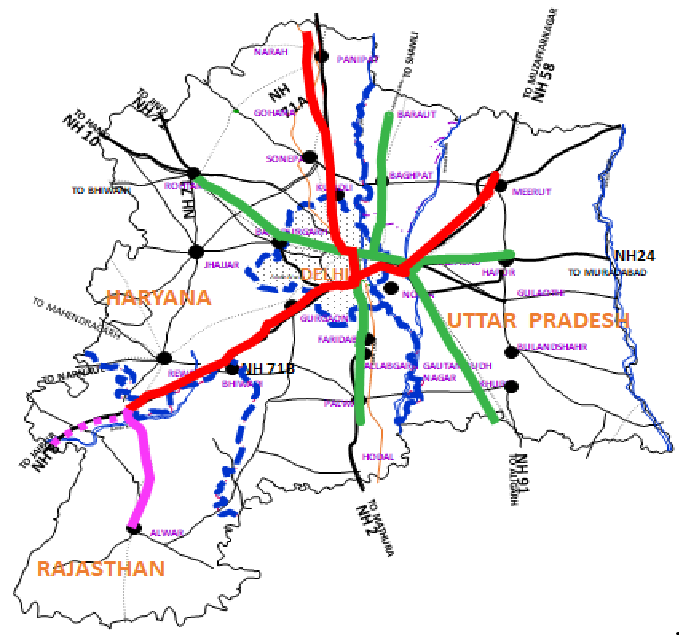 Delhi Integrated Multi-Modal Transit System for Delhi-Meerut and Delhi-Panipat and M/s. Urban Mass Transit Company Limited for Delhi-Alwar to carry out feasibility study and prepare the Detailed Project Report. RRTS is a new, dedicated, high speed, high capacity, comfortable commuter service connecting regional nodes in NCR. RRTS is different from conventional Railway as it will provide reliable, high frequency, point to point regional travel at high speed along dedicated path way.